As part of its “Research on Materials for the Study of East Asian Art” project, the Art Research Materials Section of the Department of Research Programming is conducting basic study of Sotan (1413-1481), the official painter of the Ashikaga shogun family during the Muromachi period. Last fiscal year, we first made a comprehensive collection of materials related to Sotan which we compiled into an archive that will serve as the foundation for our study. In executing this work, we used the method of the pre-World War II ”Corps of East Asian Arts” project that produced comprehensive results concerning some painters of the Muromachi period as reference. In the process of this work we were able not only to confirm what may be called the “universal usefulness” of the method of ”Corps of East Asian Arts” for the purpose of forming a foundation for research but also to confirm the fact that the various kinds of archives related to art history which were formed intermittently from before the war and continue to be formed from time to time even now and which are found at the Institute are still effective today. This year by studying each material in detail and by making a general judgment of the collected materials, we are improving the quality of the materials so that we may achieve a closer and more accurate understanding of Sotan. The process of this phase of the project was presented at the 2nd In-House Research Seminar (July 10, “Study of Sotan” by Watada). Many parts of this presentation delved into more details when compared with the content of the public lecture given on October 28, 2006 (“Sesshu and Sotan” by Watada). 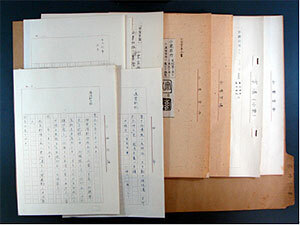 We plan to publish the results of our study in The Bijutsu Kenkyu (The Journal of Art Studies). “Kuroda Seiki: Master of Western-style Paintings of Modern Japan,” the regional exhibition for this fiscal year, began on July 21 at The Hiratsuka Museum of Art in Kanagawa prefecture and will continue until September 2. It is the Shonan district where this Museum is located that Kuroda frequently visited after his return from France and until his last years. It is also a place that played an important role in his creative activities. As is well known, after his return from his studies abroad, Kuroda influenced the art world by painting works that actively incorporated new plein air expressions. Some of such works were created at places near Hiratsuka, such as Oiso and Kamakura. 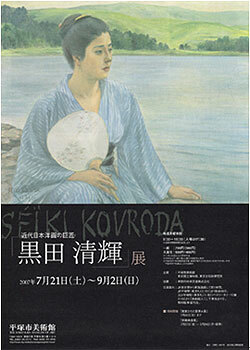 For this reason also, this exhibition aims not only to introduce the art of Kuroda in general but also to provide an opportunity to allow many people to see the relationship between Kuroda and the Shonan district, by exhibiting “Rocks by the Water’s Edge” (1896) the subject of which is the Shonan district. The Department of Intangible Cultural Heritage started a joint research with the National Museum of Japanese History on the Kishu Tokugawa family collection of musical instruments that the Museum owns. These instruments, mainly ones used in gagaku, were collected by Harutomi, 10th Lord of the Kishu Tokugawa family. The Museum owns more than 157 instruments, many scores and related documents, and published an illustrated catalogue of these materials in 2004. Based on this catalogue we plan to conduct a more detailed study with experts on traditional Japanese musical instruments. The study of wind instruments that began from July has revealed the possibility that the nokan, or the transverse flute used in noh, called “Gasho” is the “Kokyo no Nishiki” mentioned in Meikanroku, a list submitted to the Tokugawa shogunate in the late 18th century of famous transverse flutes. The Seminar Course for Museum Curators that was started in 1984 is held annually to provide curators with basic knowledge of and techniques for conservation. 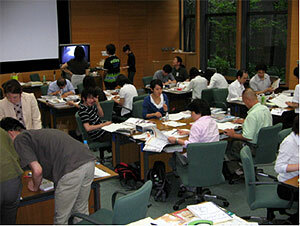 This year, the 24th Seminar Course was held from July 9 to 20 with thirty-two curators from Japan participating. The Seminar Course consists of lectures and practical work. Lectures were given on such topics as the museum environment (including temperature and humidity as well as pest control), deterioration of various types of cultural properties and its prevention. In the practical work, the participants learned about various methods of analysis using apparatuses and applied what they learned in a practical case study held at the Yokohama History Museum. Also this year, the participants heard a lecture on the conservation of materials and visited exhibition rooms and restoration studios at the Tokyo National Museum. Because many of the lectures in this course are natural scientific in nature, some of the contents may have been confusing for the participants, many of whom specialize in the humanities. However, every year we try our best to make the content as easy to understand as possible. Moreover, the sense of unity that develops among the participants who spend two weeks together in the same room is strong, and they continue to exchange information even after the Seminar Course by using a mailing list that they form during the two weeks. In this way, they contribute greatly toward improving the conservation environment of their respective museums. The mushi meishi, or insect business cards, that were introduced by Tom Strang of the Canadian Conservation Institute （CCI）and Kigawa Rika of this Institute during the IPM Workshop 2004 which the two institutions held have been published as pest cards. The cards of 33 major types of museum pests based on Cyclopedia of Museum Insects provide information about the degree of damage they cause, their appearance and actual size, and the kinds of materials they damage. The cards come as printed sheets that can be detached for storage and there is space on the reverse side for notes. 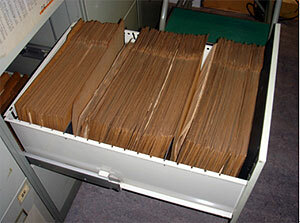 They are conveniently portable and we hope that they will be utilized on site at museums and other related facilities. We wish to express our deep gratitude to Dr. Yamano Katsuji, our visiting researcher, for his advice and cooperation in preparing these cards. 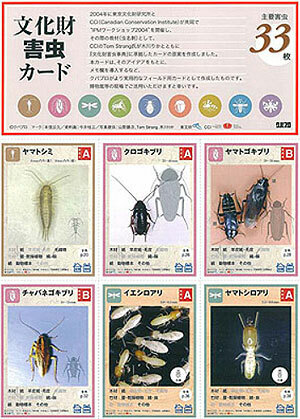 “Museum Pest Cards” are available at Kuba Pro Co. Ltd. (tel. 03-3238-1689) for 600. 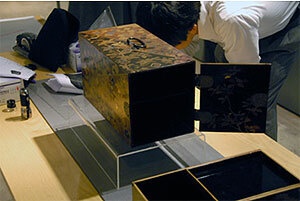 In The Cooperative Program for the Conservation of Japanese Art Objects Overseas Japanese art objects in collections at museums overseas are temporarily brought back to Japan, restored and returned to their respective owners. By restoring such objects it becomes possible to increase opportunities for their exhibition and utilization and thereby deepen understanding about Japanese culture. In addition, the project provides an opportunity for people overseas to understand the Japanese conservation methods and policies. Researchers visited Italy (2 museums: Museo Nazionale d’Arte Orientale and Museo d’Arte Orientale “Edoardo Chiosonne”) and England (2 museums: Victoria and Albert Museum and Ashmolean Museum) from July 3 to 14 to select candidate paintings. Investigation was made from such aspects as art history and restoration techniques and materials. As for craft work, Takeuchi Namiko and Inokuma Kaneki, associate curators of the Tokyo National Museum, joined researchers from the Institute to conduct investigation in England ((2 museums: Victoria and Albert Museum and Ashmolean Museum) and the Czech Republic (1 museum and 3 castles: Moravian Gallery, Velké Mezirící, Vranov nad Dyjf and Lednice Castle). From these investigations, a list was made of objects that will be restored in Japan and of those that may be restored at Cologne. These objects will be restored in future projects so that they may be exhibited again. The 16th Technical Committee of the ICC was held at Siem Reap, Cambodia on July 5 and 6. This meeting serves as an opportunity for various organizations involved in the protection of the Angkor monuments to present reports on their work. The Institute presented the results of studies to identify the microorganisms growing on the stones of Ta Nei site and to discuss the difference in the percentage of the uncovered sky (crown density) and the amount of microorganisms on the walls. 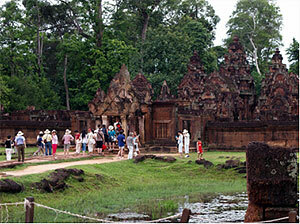 One of the themes discussed at this meeting was “sustainable development.” As the number of tourists from outside Cambodia exceeded 670,000 in 2005, appropriate procurement of tour routes and facilities is an issue to be considered not only for the protection of the sites but also for the safety of the tourists. Pollution of the Siem Reap River due to the lack of a proper sewage system and disposal of garbage has been reported. These are problems that arise when too much attention is given only to tourism, and the indispensability of international cooperation from nations that have much experience in this field was felt. The Japan Center for International Cooperation in Conservation has been conducting the “Safeguarding of the Bamiyan Site” project with the Ministry of Information and Culture of Afghanistan since 2003. This year, the 8th mission of this project was dispatched from June 9 to July 15. In this mission, joint researches with other organizations were conducted in addition to the conservation of mural paintings and archaeological investigation. For the conservation of mural paintings, previously executed work was continued at Caves I and N(a). At Cave I, mural paintings at risk of becoming detached were reinforced with grouting and edging. Conservation intervention on the mural paintings at Cave I was successfully completed with this mission. At Cave N(a), the mural paintings were reinforced in preparation for the removal of the soot-like black deposits on the surface of the mural paintings that is scheduled to be executed in the next mission. For archaeological investigation, soundings and survey were conducted in order to determine the extent of the sites requiring protection. Archaeological soundings were carried out at several places of the Bamiyan Valley and a wall possibly dating back to the Buddhist period was found at one of soundings. Surrounding valleys of Bamiyan were surveyed in an attempt to locate unknown sites, and several tombs and castles were revealed These archaeological surveys are important in understanding the Bamiyan sites, of which the Buddhist period tends to attract most attention, in the light of history that continues to the present. Joint researches were conducted with Kanazawa University, Oyo Corporation and Pasco Corporation on the study of Islamic ceramics, geological investigation and measurement of the caves, respectively. These collaborative researches will be continued and are expected to provide necessary and indispensable information and viewpoints for the protection of the Bamiyan Sites.